높이 0.98m의 철로 만든 불상으로 단호사 철불좌상(보물 제512호)과 같은 양식이며 더욱 엄격미가 강조된 점이 특징이다. 머리에는 날카롭고 뾰족한 소라 모양의 머리칼을 붙여 놓았으며 정수리에는 상투 모양의 머리(육계)가 있다. 삼각형에 가까운 얼굴, 길고 넓은 눈, 꽉 다문 입가로 내려오는 팔자형(八字形)의 주름 등에서 근엄한 인상을 보여주고 있다. 당당한 상체와 무릎을 넓게하고 앉은 자세 등 몸의 균형이 비교적 잘 잡혔지만, 팽팽하면서도 과장된 표현을 하고 있다. 양 어깨에 걸쳐 입은 옷은 좌우대칭을 지키면서 기하학적 옷주름선을 규칙적으로 표현하였으며 엄격성을 강조하고 있다. 통일신라 후기부터 고려 초기에 걸쳐 유행하던 철로 만들어진 불상 가운데 하나로 도식화된 표현으로 볼 때 고려 초기에 만들어진 것으로 보인다. 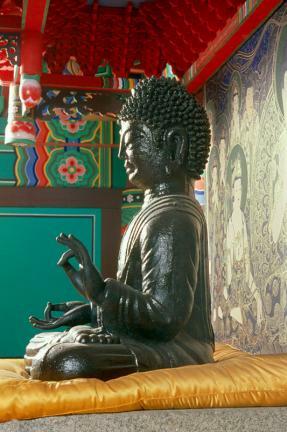 This iron seated Buddha measuring 0.98 m in height exhibits the same overall style as the Iron Seated Buddha of Danhosa Temple, Chungju (Treasure No. 512), although it can be distinguished from the latter by its restrained expression. 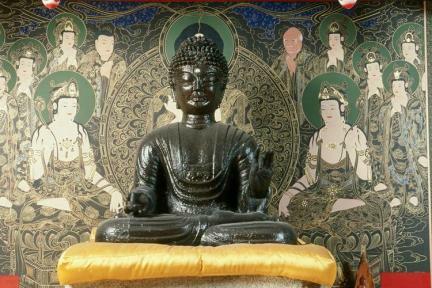 The Buddha’s hair is expressed in nabal style (i.e. twirled up and around in a seashell-shaped fashion), and a usnisa (a protuberance symbolizing supreme wisdom) can be seen on top of his head. The Buddha’s triangular face, large eyes, tightly closed mouth, and 八-shaped folds give it a rather serious or grim expression. The sturdy-looking upper body and the cross-legged posture are relatively balanced, but have a strained yet exaggerated look. The beobui (sacerdotal robe) hanging down from both shoulders is symmetrical, with geometrical folds at regular intervals, accentuating the generally restrained expression of the statue. The parallel folds in each leg are also highly geometrical. 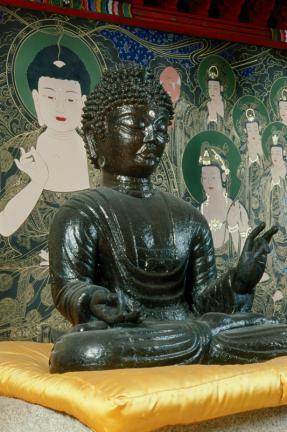 Judging from the schematic expression of the statue, it is thought to have been made during the early Goryeo Dynasty.